Robotic lawn mowers are great for cutting the grass, but they do pose a risk of injury to children playing nearby. Highly advanced sensors developed by Fraunhofer researchers ensure that the lawn mower shuts down when children are in close proximity. The system, which is based on LiDAR technology, uses a single pulse of light to capture the entire surroundings, covering a range of up to 200 meters. Levels of digitalization and automation are increasing not only in industrial environments but also in our everyday lives. More and more people today are using robotic devices to vacuum the floors or mow the lawn, for instance. In the same way autonomous vehicles negotiate traffic on the roads, robotic devices have to precisely monitor their surroundings at all times to avoid causing material damage or injury. A recent test conducted by German consumer safety group Stiftung Warentest, however, indicates that not all robotic lawn mowers perform this task satisfactorily. The test reveals, for example, that when crawling children are nearby, some of the lawn mowers studied did not stop in time and left serious cuts on the test dummies. None of the devices stopped when a replica of a child's hand was placed in front of them. Some of the robotic lawn mowers tested rely exclusively on shock sensors, which only detect and initiate a response to obstacles on impact. Given that these sensors are located a certain distance from the ground, the device's rotating blades can come into contact with children's extremities before it identifies them as hands, arms or legs. The Fraunhofer Institute for Microelectronic Circuits and Systems IMS in Duisburg is developing highly advanced optic sensors that measure the surrounding area in 3-D. They incorporate LiDAR (Light Detection and Ranging) technology, which measures the distance to the object based on the time taken for a light pulse emitted to return. The pulsed laser light is reflected by the surface of objects with which it comes into contact. 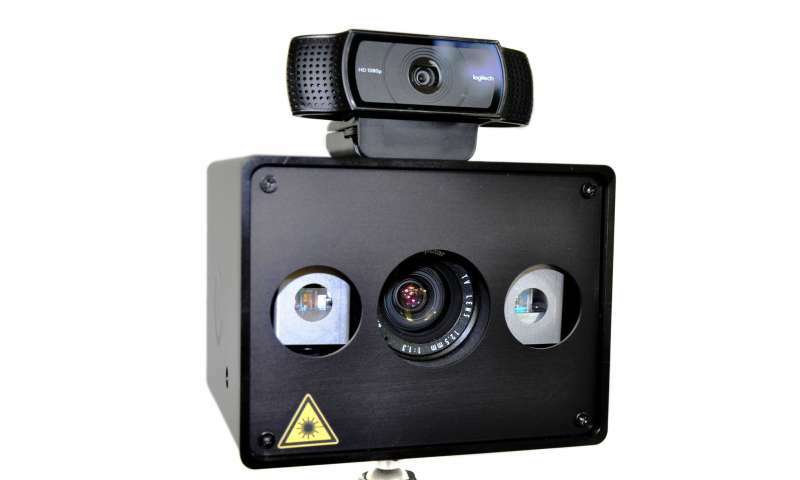 Using time-of-flight imaging cameras, the LiDAR device then captures the reflected signals. The distance and position of objects as well as the speed at which they are moving is calculated based on the time it takes for the light to reach the object and return. Thanks to CMOS technology, the photodiodes are integrated with the requisite analysis electronics on a single chip. This gives the sensors a compact design and means they can be produced economically. As a result, they can be used in products suitable for the mass market, such as robotic lawn mowers, without driving up costs. In collaboration with leading sensor and camera manufacturers, Fraunhofer IMS also offers 3-D monitoring and imaging solutions tailored to customer specifications.